If you watched my interview on the Business News Network yesterday and read my seasonality article, you will know that I am bullish the Canadian dollar for a variety of reasons. Yesterday, USD/CAD was trading at 1.24 and hopefully you were able to bank some pips following the interview. However if you haven’t I still believe that USD/CAD is headed lower. As you can see in the following chart, the currency has entered the “Sell Zone” which I determine using Bollinger Bands. A confluence of moving averages and a key Fibonacci level made 1.2415 a very strong resistance point. The 1.22 level will also be a key support to watch as it represents the monthly lows, but if that level is cleared, USD/CAD could be on its way back to 1.20. 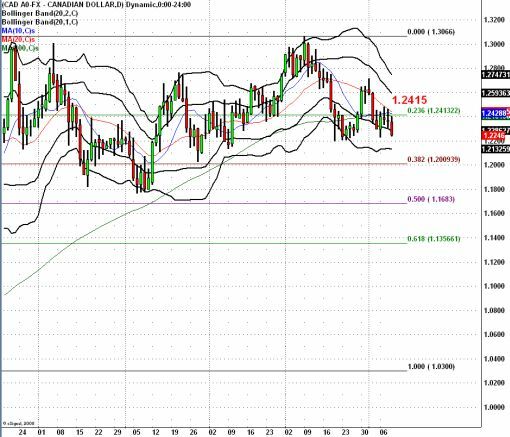 I also talked about shorting EUR/AUD in my RBA preview on FX360.com Monday. It is now below a very significant support level and as long as it does not close back above 1.85, it could fall as low as 1.80 (EUR/AUD chart at the bottom of the article).